Turkish Hebrew poet and corrector for the press or, perhaps, printer; flourished at Constantinople in the first half of the sixteenth century. He was active in Hebrew printing from 1513 to 1549, as appears from the following works which bear his signature: David Ḳimḥi's "Sefer ha-Shorashim (1513); Jacob b. Asher's "Perush 'al ha-Torah" (1514); Isaac Ḳara's "Toledot Yiẓḥaḳ" (1518); Midrash Tanḥuma (1520); Joshua ibn Shu'aib's "Derashot" (1526); David Ḳimḥi's "Miklol" (1532); the four Ṭurim (1540); "Shirim u-Zemirot" (1545 or 1548), a collection of hymns by various authors, including some of his own; and Solomon ibn Melek's "Miklal Yofi" (1549). Wolf ("Bibl. Hebr." i. and iii., No. 2002) seems to ascribe to Solomon the authorship of the whole collection of hymns mentioned above. 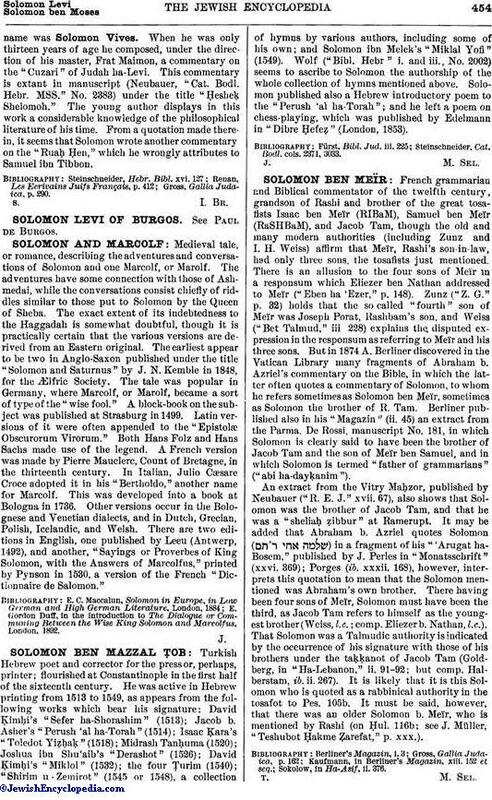 Solomon published also a Hebrew introductory poem to the "Perush 'al ha-Torah"; and he left a poem on chess-playing, which was published by Edelmann in "Dibre Ḥefeẓ" (London, 1853). Steinschneider, Cat. Bodl. cols. 2371, 3033.